Hanukkah is the Hebrew word for dedication. 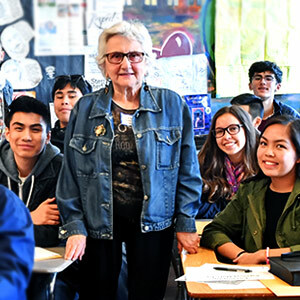 During this year’s celebration I find myself reflecting on what dedication required and meant during the time of the Maccabees (160 BCE) and the Holocaust (1933 to 1945), and what it means to me as the director of the Holocaust Center. What did dedication to Judaism and Jewish identity mean in the time of the Maccabees? One might say armed resistance. The passionate fight for religious freedom and tradition is a constant theme throughout Jewish history as is exemplified by the story of Hanukkah, which commemorates the story of the Maccabees who against great odds overthrew the Syrian army and reclaimed the temple in Jerusalem. What did dedication to Judaism and Jewish identity mean for European Jews during the Holocaust? While some Jews did against great odds, take up weapons and fight, others demonstrated their resilience through religious observance. Jewish life in Nazi Germany was under constant attack. While the Holocaust was, above all else, an attack on Jewish life, it began as an assault on Judaism. During the infamous 1938 November Pogrom, known as Kristallnacht, non-Jewish citizens throughout Europe burned down over 1,000 synagogues and desecrated countless Torah scrolls. In a more subtle attack, on October 5, 1938 all Jews in Germany were required to have their passports stamped with the red “J”, and this date coincided with Yom Kippur (the day of atonement), the most religious day of the year. In short, before the Nazis formulated their plan for the complete annihilation of the so-called Jewish race, they sought to sever the heart of the Jewish people by eliminating their spiritual and cultural identity. Hanukkah celebration in Westerbork transit camp, 1943. Photo courtesy of Yad Vashem. To counter the constant spiritual dehumanization perpetrated by Nazi Germany and their collaborators, many Jews found clandestine opportunities to celebrate Jewish holidays and maintain their dedication to the Jewish tradition. For example, let us consider spiritual resistance at the camp of Westerbork. From 1942 to 1944 the Westerbork transit camp deported 97,776 Jews to death, annihilation, and transit camps. Most Jews were only in Westerbork for a short period of time, but as in many other ghettos and concentration camps, spiritual resistance ignited despite conditions intended suppress it. Inmates practiced shabbat (Jewish Sabbath) while saying the hamotzi (prayer for bread) over their very small ration of stale and moldy bread or found moments of joy and celebration around Jewish festivals. 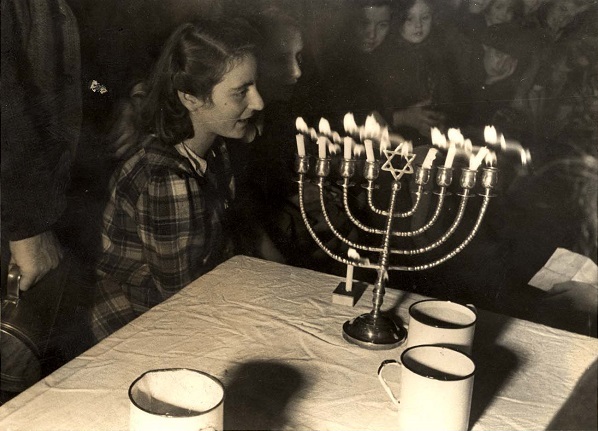 In December 1943, a few dedicated Jewish youth leaders gathered together to create a Hanukkah celebration complete with candle lighting and singing. The incredible photo above was taken on the seventh night of Hanukkah by Rudolf Werner Breslauer, a Jewish inmate in Westerbork. I believe in light of the recent tragic shooting at the Tree of Life Synagogue in Pittsburgh the Jewish community needs to show the world we stand up against oppression and are proud of our traditions. Resistance and resilience, as shown by the stories of armed and spiritual resistance, take many forms. To me, resistance to antisemitism and racism takes the form of pride and love. This week Jewish Family and Children’s Services hosts several Hanukkah celebrations. My favorite is our Hanukkah party for Bay Area survivors and “3gs” (grandchildren of survivors). These two groups are separated by more than fifty years, but are deeply connected by the tradition to eat, sing, and celebrate life. This Hanukkah, place your menorah in the window for the whole world to see your dedication.